BALOB TEACHERS’ COLLEGE OWNED AND OPERATED BY THE EVANGELICAL LUTHERAN CHURCH OF PAPUA NEW GUINEA SINCE 1969 WILL SOON BECOME A FOUNDATION SCHOOL OF EDUCATION OF THE LUTHERAN UNIVERSITY OF PAPUA NEW GUINEA. IN ITS ENDEAVOUR TO UPGRADE POTENTIAL ACADEMICS OF THE UNIVERSITY, THE LUTHERAN UNIVERSITY SPONSORED CURRENT LECTURERS OF THE COLLEGE TO UNDERGO AN INTENSIVE MASTER OF EDUCATION DEGREE STUDIES WITH CHARLES STURT UNIVERSITY IN AUSTRALIA. BELOW IS A PHOTO SHOT OF THE PROUD GRADUATING STUDENTS IN THEIR ACADEMIC ATTAIRE. 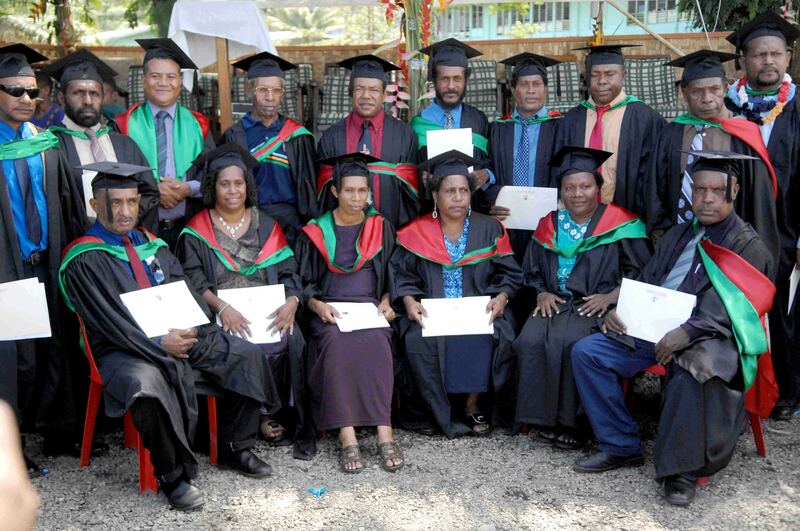 On Monday May 16th a small but significant ceremony in the history of Papua New Guinea was held to recognize 17 lecturers at the Balob Teachers College who graduated with a Masters in Education and with flying colours. Two of these Lecturers Mr. John Hulum and Mr. Peter Seth graduated with High Distinctions. Additionally, two lecturers were awarded a Graduate Certificate in Education. The Masters degree Program was provided by Charles Sturt University and the Lecturers, were fully sponsored by the Lutheran University of Papua New Guinea at a total cost of nearly 1.2 Million Kina. It was a demanding program that was delivered by visiting professors and completed with online work. This graduation marked a new era for the Lutheran University in its capacity building program designed to secure professional academic staff for its initial Theology and Education Faculties. Each lecturer in the Masters Program signed a contractual agreement to work for LUPNG for three years before considering other options once courses begin to be offered at the Lutheran University. “Congratulations to LUPNG on your commitment to upgrade the qualifications of your (future) staff and we acknowledge that investment which is the cornerstone on which you (LUPNG) will build your new University,” Professor Toni Downes said. Professor Toni Downes, who is the Dean of the Faculty of Education at the Charles Sturt University, was on-hand to officiate the ceremony and said Charles Sturt University had a proud history of partnership in Papua New Guinea. “Over the last 10 years, we have worked with the Education Ministry and graduated a large cohort of Masters Students from across the institutions. We are delighted with the outcome of this most recent partnership and we look forward to furthering our partnership in the future,” she said. LUPNG’s Acting Project Director, Dr. Brent Kilback said LUPNG and Charles Sturt University have put people first by building the capacity of the Nations Academics. “It is not by accident that you are here today. This is the largest group of graduates who are graduating with an advanced degree from one institution at the same time and it is a notable achievement,” he said. “This accomplishment places you in the forefront of education in Papua New Guinea. These are words of encouragement to each of us. Take your newly earned master’s degree to enlarge your teaching ability; take your newly earned master’s degree educating your students with your research and teaching techniques. Based on May 17, 2001 Post Courier Report by Frank Rai/obtained from Lutheran University of Papua New Guinea official Website. The blogger is another PhD student sponsored by the same university studying in the Faculty of Arts, School of Theology at UTC, North Parramatta of Charles Sturt Univeristy, Sydney. NSW, Australia. This entry was posted in Uncategorized and tagged Balob Lecturers' Graduating with Masters in Education, Lutheran Univserity. Bookmark the permalink.